The Pizza calories table below shows the number of calories in some common round pizzas. The pizza calories are calculated for their average size, about 9 inch in most cases. 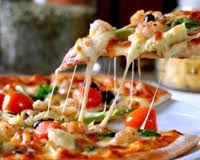 Some are common items ordered from pizza delivery companies and a few are from supermarkets bought as frozen products. Remember frozen pizzas bought at supermarkets tend to be cheaper, they often have more weight in the base and less weight in toppings resulting in a little less calories. For accuracy and ease if you cut a pizza into 4 even portions then simply divide the pizza calories by 4 to get calories per slice. All values correct at time of testing, values may vary between different pieces. Pizza calories will vary depending on the amount and type of ingredients used. Portion size is very often a subjective view and may again vary according to bowl, cup or plate size used.